September - see below for more details ). 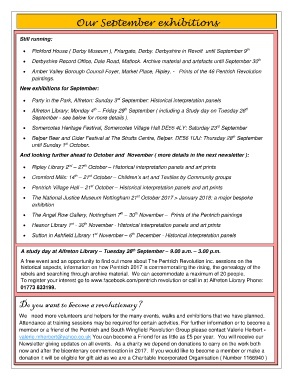 A study day at Alfreton Library – Tuesday 26  September – 9.00 a.m. – 3.00 p.m.
rebels and searching through archive material. We can accommodate a maximum of 20 people. Do you want to become a revolutionary? We   need more volunteers and helpers for the many events, walks and exhibitions that we have planned.